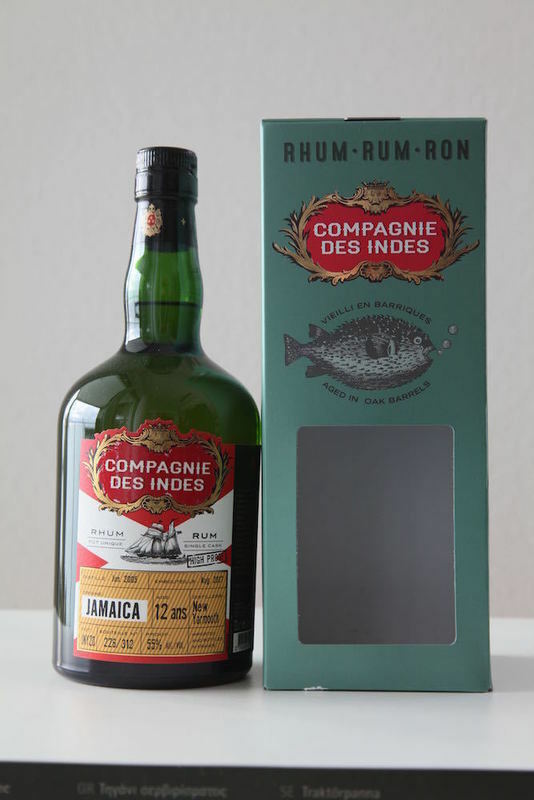 Have you found an online vendor selling Compagnie des Indes New Yarmouth 2005 - Jamaica - Cask JNY20? I love these high ester rums ... whilst I was pouring a glass my wife in 3 meters distance already said "mmmh tasty". After some time it becomes fruity with aromas of pineapple, apple sirup, raisins and white wine. Furthermore there are notes of cookie dough and ice-cream. Very intensive indeed and depending on the angle, distance and time that I hang my trunk into the glass the aromas are changing a lot. Harsh and spicy at first mouthfeel with aromas of chili, ginger, banana and solvents. Then more an more fruity aromas are coming up with white wine again. In the background there are oak and herbs. Very long, changing between spicy and sweet. Hints of solvents are still present. Herbal aromas in the aftertaste. I do not like the solvents. On the other hand my wife hardly did not smell and taste any solvents at all - for her the rum smelt and tasted very fruity. The differences between the two of us were really striking. Nevertheless this is definitely a rum, which does not have to hide behind the famous Hamden High Ester Rums. Ca pue le solvant, le fruit pourri (banane, ananas, brugnon), l’olive et une note de persil (?!?!). J’adore. La bouche confirme ce que le nez annonçait (olive, fruits bien mur…) sans agression de la part de l’alcool (qui est bien présent hein) mais plutôt bien intégré et qui tapisse la bouche. La finale est très longue et rajoute à l’alchimie des fruits à coque, toujours sans se débarrasser des fruits bien mur, puis arrivera en dernier de la pomme. My taste is not here yet, coming from the sweeter rums this one was some of a kick, quite a different taste than what I was expecting. Heard the word funky about this one, can agree, however not for me at the moment. I'll come back to this one later, if possible, when my taste have opened a bit more. Edit: Upgraded previous score from 4 to 7 after another taste.